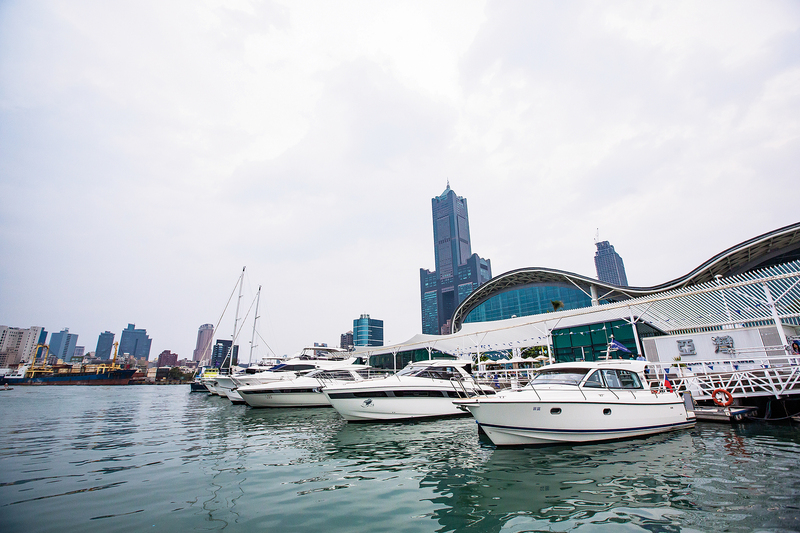 George Chang, general secretary of the Taiwan Yacht Industry Association, believes that the extensive supply chains that the industry long ago developed in Taiwan constitute a major advantage. For yacht enthusiasts, a yacht isn’t merely a tool of leisure and transport. It is an expression of one’s status. 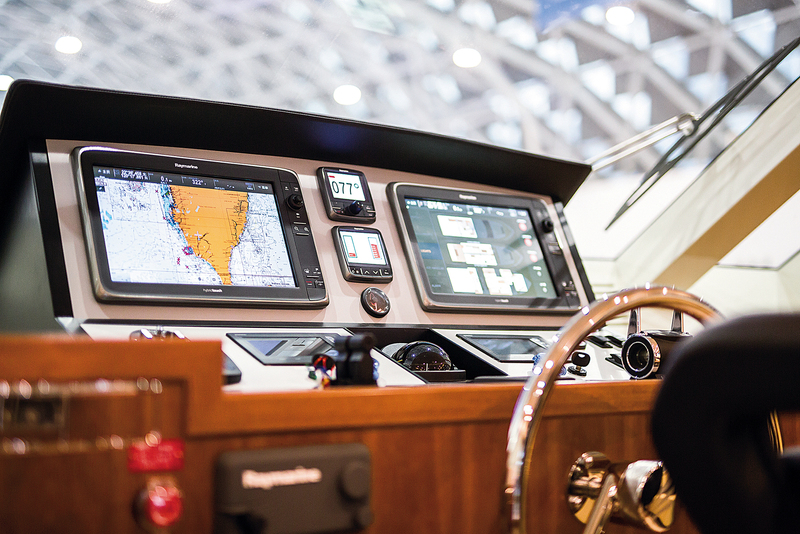 Touchscreen control panels merge power, entertainment and navigation functions. 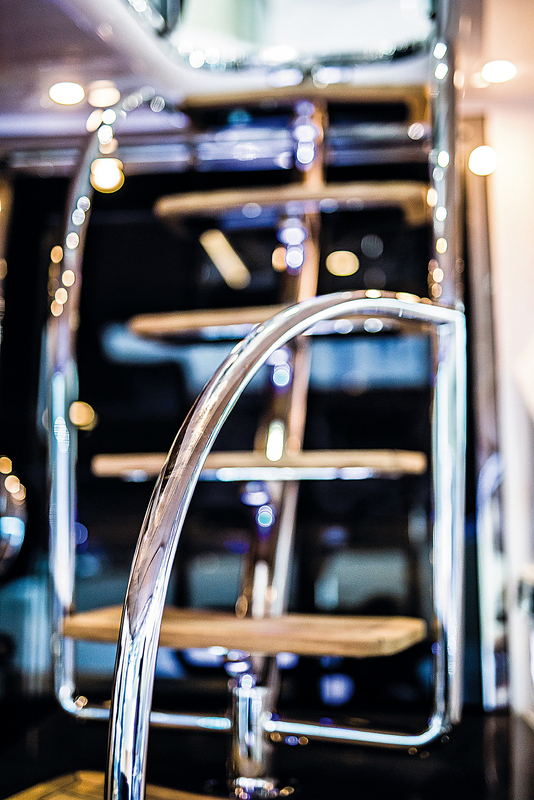 Sophisticated control elements and sturdy metal handrails with an oval profile demonstrate the technological prowess and refined craftsmanship of Taiwan’s yacht makers. 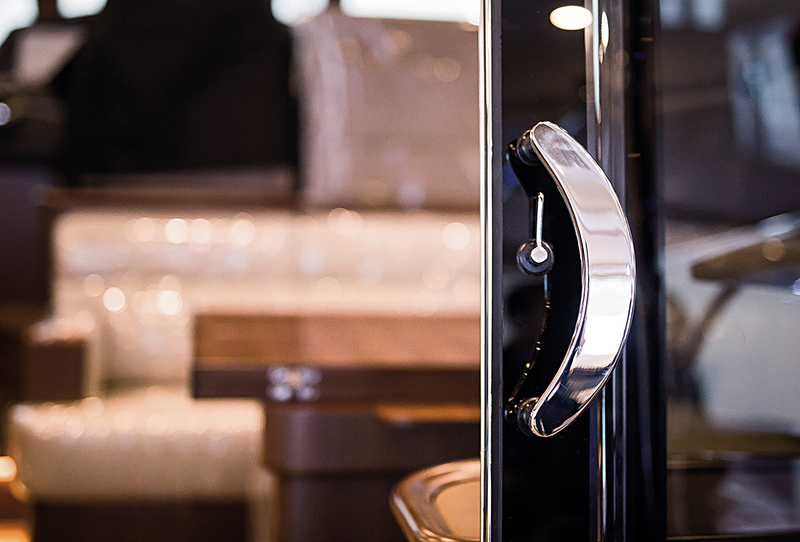 Handcrafted furniture and fittings, with an emphasis on refinement and comfort, offer a luxurious feel at sea. Taiwan’s “megayacht” industry—building yachts 80 feet or more in length—is the largest in Asia and the fourth largest globally. Taiwan long ago earned the nickname “yacht kingdom,” but in truth the sector experienced contraction in the 1990s and was hit hard by the global financial crisis in 2008. In response, firms buckled down, adjusted, and transformed themselves into a high-tech industry with the highest of standards, making customized luxury megayachts. Once again, Taiwan’s yacht industry has navigated through perilous waters to establish a place for itself in the global marketplace. 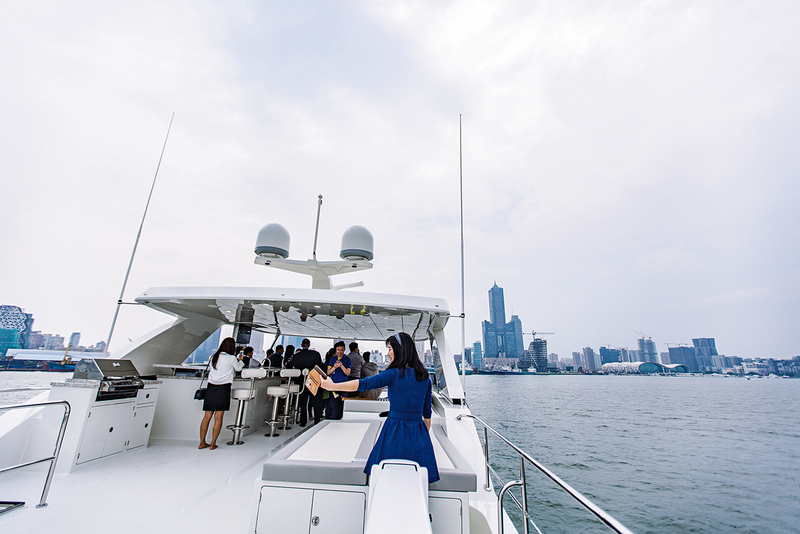 Set off against blue skies and water at Horizon City Marina in Kao­hsiung, an 85-foot Ocean Alexander motor yacht, with a price tag of NT$200 million, glistens under the sun. With two 1600-horsepower engines and twin propellers, the OA 85 is capable of a top speed of 22.5 knots. Crashing through the waves and leaving a large wake behind it, the yacht can circumnavigate Taiwan on a single tank of fuel. The Hua­lien marble countertops, the master stateroom with twin bathrooms, the in-floor heaters, the ultraviolet germicidal lights and the air conditioning all come as standard. 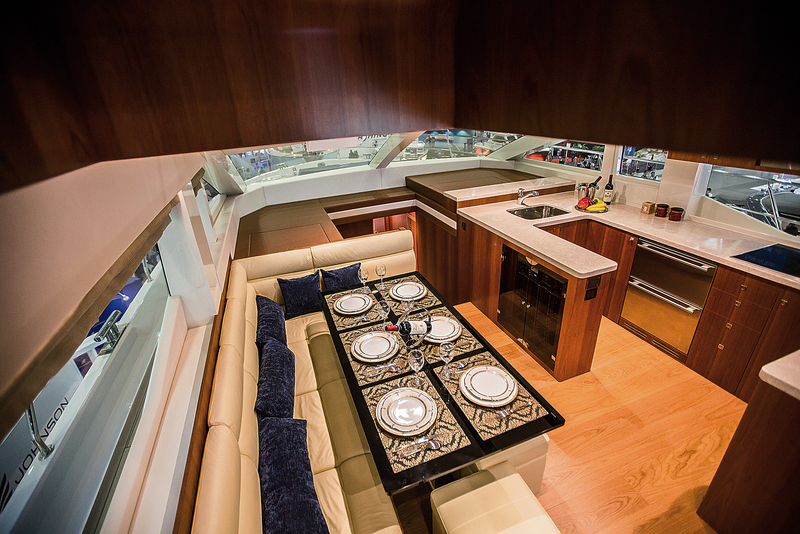 Customized to meet the owners’ needs, the two upper decks each feature a bar, and the yacht is equipped with a stabilization system that doesn’t require dropping anchor, as well as a touchscreen system panel for controlling power, entertainment, and navigation. 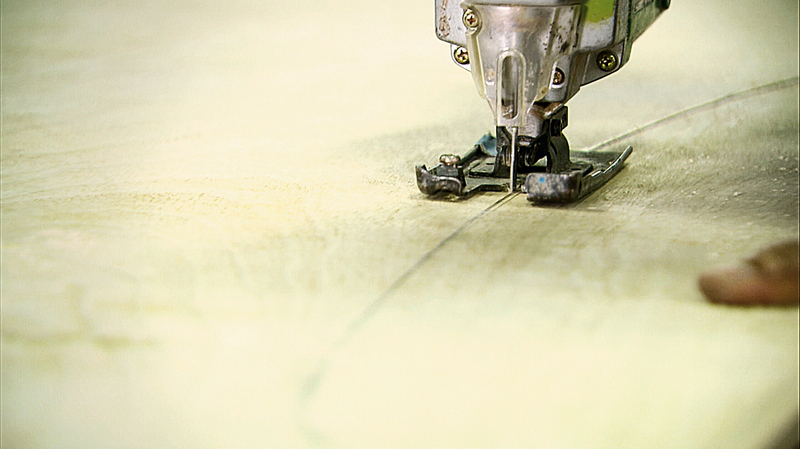 Collectively, these features amply demonstrate Taiwan’s prowess in yacht craftsmanship, technology and design. Figures from the Ministry of Finance show that in 2017 Taiwan’s yacht exports totaled NT$4.27 billion. Exports to the Americas accounted for 79% of total production, to Europe 10%, and to Asia 7%. According to the world-­famous magazine ShowBoats International, Taiwan is the largest Asian producer and fourth largest global producer of luxury yachts of 80 feet or longer. Taiwan’s excellence in producing these “megayachts” is the fruit of a transformation that the industry here undertook after a decade of decline and the shock of the 2008 financial crisis. The NT dollar started to rapidly gain value after 1988 (with the US to NT dollar exchange rate dropping from 40 to 25). NT$20 million yachts were suddenly earning NT$10 million less when exported. What’s more, manu­factur­ing wages were rapidly rising in Taiwan, and businesses became embroiled in vicious price wars. The yacht industry spiraled into ten years of decline, with more than half of yacht makers closing and with export earnings standing at one-third of peak. 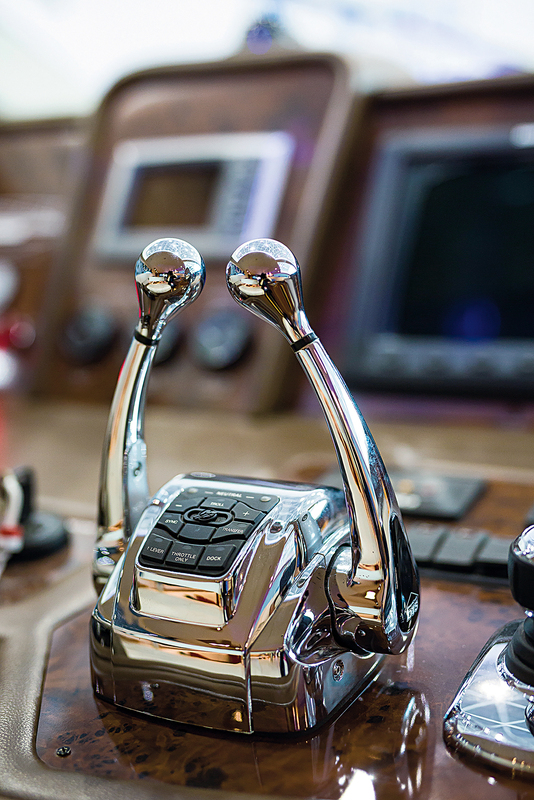 To raise export competitiveness, yacht industry enter­prises, apart from consolidating their operations and laying off workers, strove to transform themselves by turning their focus to large luxury yachts and by relying on innovation and design prowess. Apart from adding value, these changes expanded profit margins, as the industry concentrated on building floating paradises that demonstrated their owners’ status and dreams and provided leisure experiences. 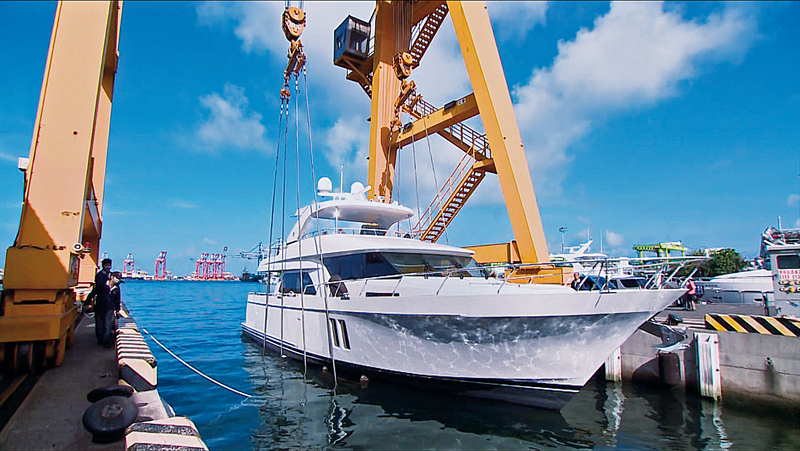 Reviving from hard times, Taiwan’s yacht industry exported boats worth a total of more than US$300 million in 2008. Yet only by innovating and emphasizing R&D can you successfully introduce cutting-edge processes and techniques. 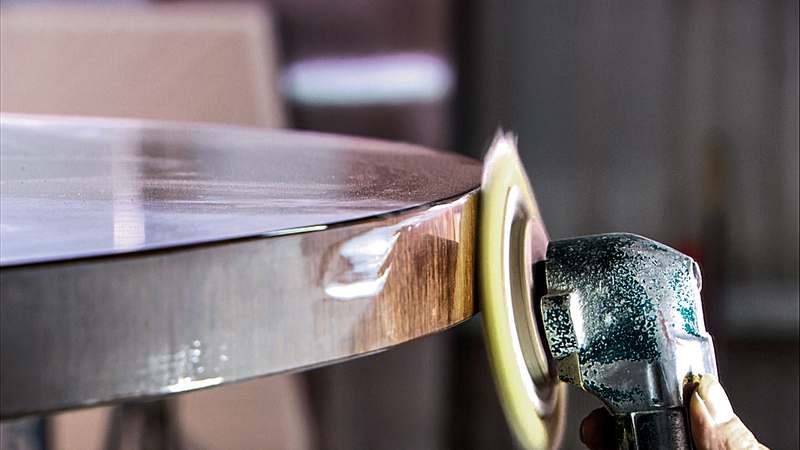 Taiwan is the only nation in the world where the government supports an R&D center for yacht materials and design. For instance, most people looking at yachts will notice their smooth, shiny hulls. But hulls built from fiber-­reinforced plastic (FRP) can be subject to an effect called “print-through,” in which the pattern of the reinforcing fibers is visible in the hull surface in a way that luxury yacht owners find undesirable. Eric Tai, project manager in the Yacht Industry Department at the Ship and Ocean Industries R&D Center (SOIC), explains that to ameliorate the effect, Taiwanese yacht builders take a labor-intensive approach, painstakingly putting more than 20 coats of paint over the FRP to achieve the kind of mirror-like paint surfaces found on cars. These high standards were enough to meet the needs of Louis Vuitton’s CEO, for one. After Wall Street’s crisis triggered a worldwide financial tsunami in 2008, the global market for yachts shrank by 40%. The crisis hit Taiwan’s industry hard. Orders declined sharply as difficult economic times once again challenged the industry’s ability to adapt. A big part of the problem was that Taiwan’s yacht industry had an OEM orientation. Although that approach had offered stability, it had also brought subjuga­tion to the brand owners, who would take most of the profits. In comparison to major European producers, Taiwan’s labor was cheap, so the industry here began to leverage its price advantages and outstanding workmanship to develop its own brands. Crisis had forced a new strategy. There are now more than 30 yacht manufacturers in Taiwan, and most have their own brands. Among the more famous firms are Horizon, Johnson, Kha Shing, and Novatec, which make many different boat models to meet the needs of a variety of customers and markets. To varying degrees, these companies have each made the leap from OEM producer to brand-name manu­facturer. Among them, Ocean Alexander immediately started producing for its own brand upon its founding in 1978. Rather than building completely customized yachts, it has adopted a strategy of standardized production combined with partial customization. Confronting the financial crisis in 2008, the managers at Ocean Alexander gritted their teeth and made changes to achieve better financial health, improving management procedures and shortening the time required to build each boat. Once the economy took a turn for the better, orders began to pour in, and Ocean Alexander has been riding the warm currents ever since, increasing its revenues year after year. According to a 2017 ShowBoats International report, Ocean Alexander is the world’s fifth largest yacht maker, holding the largest share of the North American market. It is also the first publicly listed yacht maker in Taiwan. 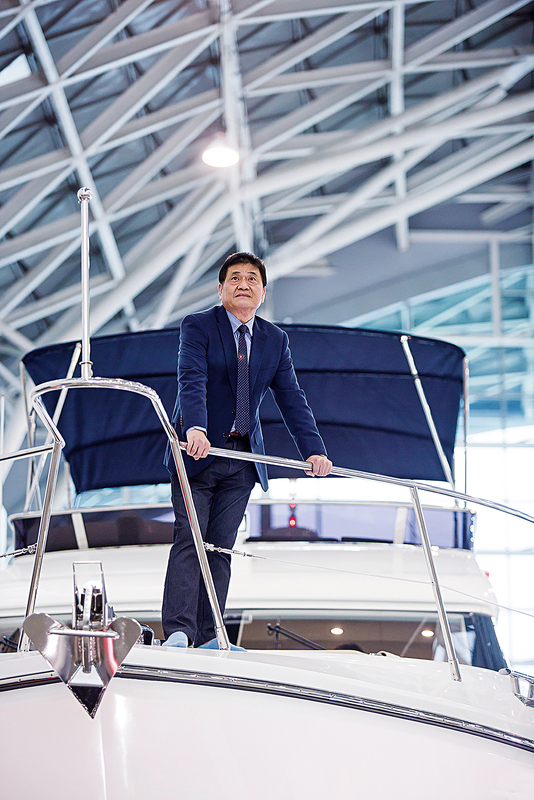 Having observed the ups and downs of the industry over many years, George Chang, general secretary of the Taiwan Yacht Industry Association, notes that in the 1980s and 90s mainland China wanted to transplant Taiwan’s yacht industry to the mainland. 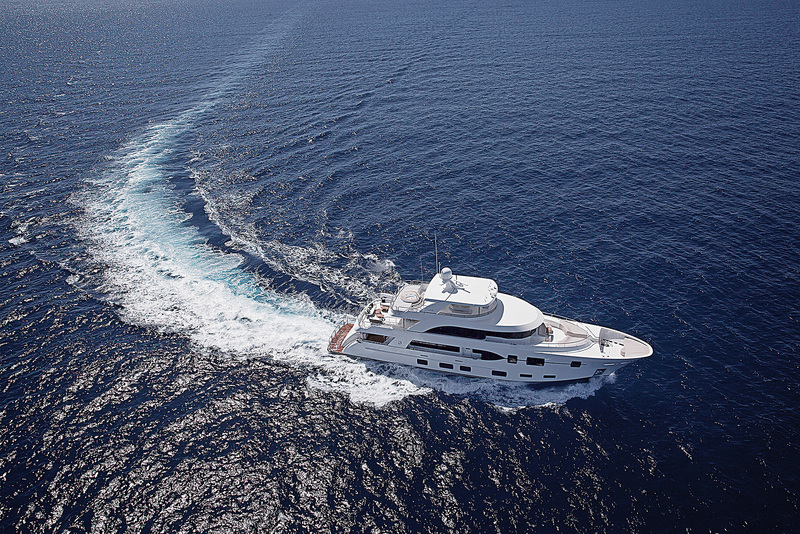 Many Taiwanese yacht makers were approached with offers of tax and lease subsidies. Chinese firms also bought up major yacht makers around the world, and by 2008 the PRC had become the world’s eighth largest yacht-making nation. “Taiwan long ago developed complete raw material supply chains,” says ­­Chang. “It’s not like you can just say let’s replicate it, and then replicate it.” Currently, mainland China is technically behind Taiwan. The mainland still hasn’t been able to overcome that deficit. 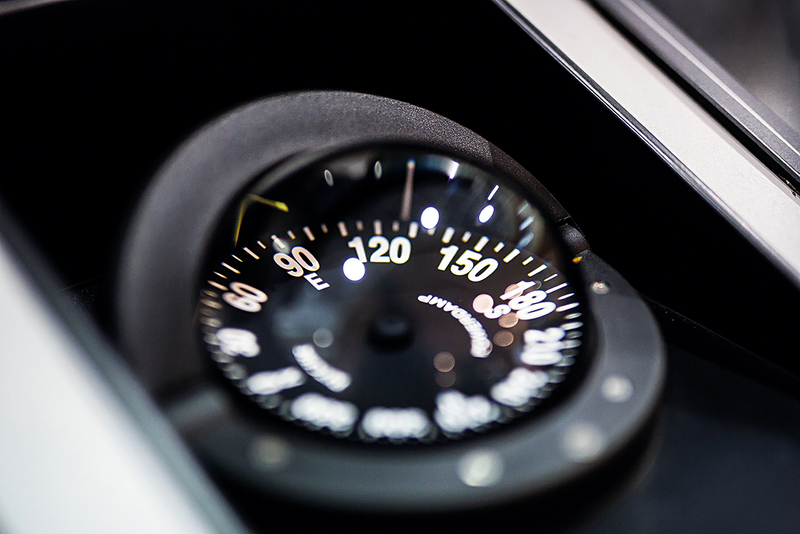 That’s because “the magic is in the details.” Yacht building is a precision assembly industry and requires strong abilities at integration. Foreign buyers have discovered that the parts on yachts built in Taiwan don’t develop any strange sounds even after weathering a stressful year or two at sea. Comfort and reliability are what Taiwan leverages for repeat business, and those qualities are a big part of its global success. The greatest challenge that Taiwan’s yacht industry faces today is the aging of its master craftsmen. 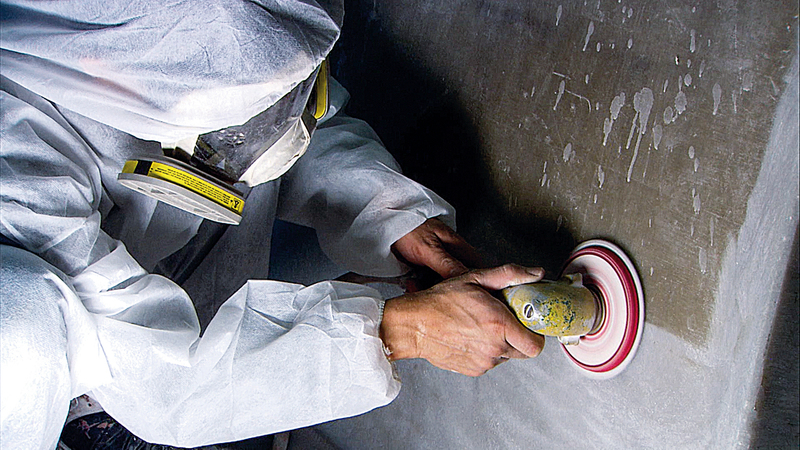 The tough working environment for mold makers, carpenters, welders and the like doesn’t appeal to many young people, and the resulting generational labor gap constitutes a looming crisis for the industry. To overcome this problem, the Taiwan Yacht Industry Association is currently working with the SOIC to develop customizable modular furniture, introducing digital 3D modelling to enable “simultaneous construction”—with mold making, painting and so forth outsourced to “onshore” furniture factories—leaving the old masters to handle the remaining work at the yacht companies’ boatyards. The strategy will both make for more seamless custom work and help to resolve the labor shortage. Surrounded by water, Taiwan regards the sea as a conduit to the rest of the world, rather than an obstacle. From producing as OEMs for export in the 1970s to marketing world-famous luxury yacht brands in the current era, Taiwan has long been building yachts that the global rich have been honored to own. The yacht industry represents another economic miracle for Taiwan. More than 20,000 yachts exported from Taiwan have sailed the seven seas, bolstering Taiwan’s reputation as the “yacht kingdom” and putting the wind in its sails as it navigates toward continued economic success.